Police broke up a party at 33 Arden St. (click for map) Saturday night that they said looked like a scene out of the movie "Animal House." Leonard J. Samia, one of Boston's largest and most notorious landlords who owns many buildings in Allston and Brighton, is evicting tenants from a building he owns in the New Orleans suburb of Terrytown. Many say he is using the chaos of the Katrina aftermath to take advantage of these tenants. Residents of Allston and Brighton are familiar with the Samia name. His offices are on Birmingham Parkway in Brighton and he owns many properties here. (I am looking out the window of my house at a For Sale sign he has in front of a property he owns on Mansfield Street.) In 1999, a three-story deck at a Samia-owned apartment building in Allston collapsed, injuring 15 people. As a result, Samia was cited with nine building code violations, including operating an illegal boarding house. City inspectors said the two-year-old deck had been attached to the building with only nails. Police in Brighton and Allston have arrested about 68 people, many of them Asian, in connection with prostitution rings, said Captain William Evans. Allston-Brighton TAB: Brighton Allston Bicentennial: "For more information, call Theresa Hynes at 617-782-1718 or Tim Schofield at 617-557-4545, or e-mail him at tim@schofieldlawfirm.com"
To follow up Charlie's comment on a previous post, here is a link to a Globe story from January 1 about improvements to Comm Ave. It sounds like a great project. As it says below, there is no timetable for the project to be extended through Allston and Brighton. Because it is a state project, Reps Honan and Moran are probably the ones to talk to for more information. The Massachusetts Highway Department hopes to award a $12.7 million contract shortly to rebuild the road, as well as the sidewalks and median, between Kenmore Square and the Boston University Bridge. "It's an effort to make Commonwealth Avenue much more pedestrian-friendly," said MassHighway spokesman Jon Carlisle. The three westbound travel lanes would be compressed to two most of the way from Kenmore Square to the BU Bridge. With the new space, the median where the Green Line trolleys run would be widened and landscaped, and sidewalks would be rebuilt. Trees and benches would be added. The plans also call for the crosswalks to be raised and made more visible. To enhance traffic flow, the traffic signals would be synchronized. Boston University would give up a slice of a parking lot near the BU Bridge to allow construction of a new right turn lane onto the bridge from westbound Commonwealth Avenue. The work is expected to take 2 1/2 years. MassHighway expects to award the contract soon in hopes of having the project start in the spring. The state plans eventually to rebuild Commonwealth Avenue all the way to Boston College, although there is no timetable for that work. State Senate - Galluccio vs. ??? Cambridge City Councilor Marjorie Decker isn't running for the seat being opened up by Jarrett Barrios. Will anyone else step up to make this a race? This is an interesting web site of data about population, health, housing, and open space in Allston, Brighton, and all of Boston. It has information about the whole city and each neighborhood (select from the 'Geography at a Glance' menu on the left) and shows historical trends using census data from 1990 and 2000. To keep a lid on its explosive mix of booze and youths, Boston has a new rule that police be told of every beer keg sold. But the law has a hole in it. Police Bust Allston Keg Party: Five people are under arrest and will be arraigned in Brighton District Court after police say they provided alcohol to minors at an Allston house party. Shortly after midnight on Saturday, officers were called to Wadsworth Street (click for map) where there were reports of 200 college students fighting in the streets. Lots of $$$ in Boston politics. Here is what some candidates spent in 2005. Mayor Thomas M. Menino spent nearly $1.7 million and raised $1.3 million. He has $202,000 left in his campaign account. City Council President Michael F. Flaherty Jr. spent $512,000 and has $225,000 in the bank. John Connolly spent $330,000 but finished a losing fifth in the November election. Sam Yoon, who came in third, spent $220,000. Councilor Stephen J. Murphy spent $149,000; Councilor Felix Arroyo spent $130,000; Matt O'Malley spent $84,000; and Edward Flynn, spent $73,000. You can go here to vote in an online poll at Boston.com. Current results are 32% support the law, 68% oppose. This is an opportunity for high school students in the Boston Public Schools to spend a morning observing someone at work. The Boston Private Industry Council is still looking for volunteers to have students shadow for the morning of February 2nd. Please circulate this to friends and co-workers. If you are interested, please visit www.bostonpic.org or contact Josh Bruno at 617-488-1327, jobshadow@bostonpic.org. Even if these are not in your neighborhood and may not directly affect you, zoning board decisions set precedents that in the future could be relevant to something where you live. So if you would have an opinion if this was happening next door, it is worth writing a short letter about these appeals. You can download zoning codes and maps here. The Allston-Brighton zoning is in Article 51. Hearings at 9:30am, Tuesday Jan 24 in Room 801, City Hall. For more information, call the Board of Appeal at (617)635-4775. In the state that produced Michael S. Dukakis and Sen. Kerry, the concerns of ordinary citizens are so often met with disdain, while the political class lets nothing get in the way of its own appetites and priorities...This is a state in which a tax cut can be decisively approved by the voters yet never go into effect. In which grocers can be prosecuted for pricing milk too low. In which archaic blue laws decree when shops may and may not open for business. At each forum, residents, community leaders, and city officials will share ideas about how to improve the city and about Boston's long-range plans, Menino's office said yesterday. The mayor will lead each discussion. Participants will be selected by lottery from a pool of people who register in advance. Residents can sign up online at www.cityofboston.gov/mayor/mayor_roundtable_form.asp or by calling 617-635-4500. The deadline is Jan. 27. Finneran ready for business - The Boston Globe: "Having passed the one-year mark since his departure from the State House, Finneran is no longer legally barred from lobbying his former colleagues"
''This will be perfect for him; he's one of the brightest guys who ever served in the building," said former House speaker Charles F. Flaherty. Flaherty, too, is a State House lobbyist and, like Finneran, changed careers under a haze of legal troubles. TownOnline.com - Brookline TAB - Local News: "Joseph, 20, is charged in connection with the shooting of 23-year-old Maseresha Demes, of Allston, on the morning of Oct. 7 outside an Allston apartment complex. " 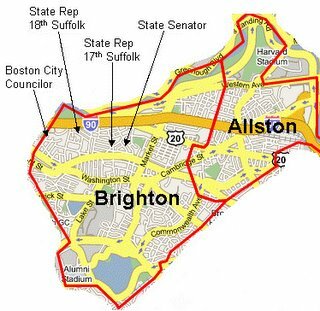 The State Reps who represent Allston, Brighton, and some of Brookline live less than 4/10ths of a mile from each other but more than 2 miles from some of their constituents. My State Rep lives less than 2/10ths of a mile from his State Senator, but my State Senator is someone else who lives 2 miles away in Cambridge. Many elected officials live near each other in Brighton. I don't know of any who live in Allston. 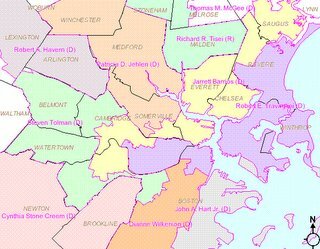 District Boundaries - Do they help or hurt Allston and Brighton? Parts of Allston are represented in the State Senate by Jarrett Barrios (district in yellow). Brighton and other parts of Allston are represented by Steve Tolman. One argument could be made that it helps to have two senators and two reps interested in what is happening in the same area. A different line of reasoning is that this dillutes our influence, reduces accountability, and diminishes civic engagement. - Keep towns and city neighborhoods together. - Prevent redistricting from intentionally protecting or harming any candidate. - Foster competition by treating incumbents like any other candidate and creating opportunities for local elected officials to "move up". - Protect the voting rights of minority communities. - Require a public process and public input. 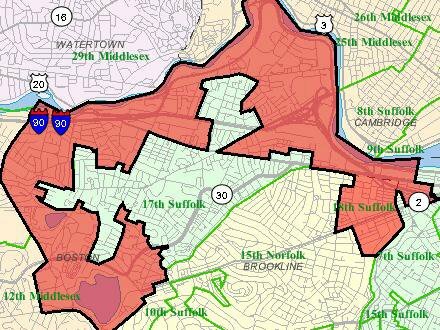 Here's how Allston and Brighton are divided up between the House districts that are held by Kevin Honan (17th Suffolk, in green) and Mike Moran (18th Suffolk, in red). You can see the 17th Suffolk boundary on an interactive Google Map here. The task force will serve as an advisory board to the Boston Redevelopment Authority and Harvard University throughout the master planning process. Natalie Sumner, 18, a Franklin, New Hampshire High School student and Julio Ceus, 33, were shot to death about 9:23 p.m. inside Ceus’ 244 Kelton St. apartment in Boston’s Allston neighborhood, police and relatives said. A high-ranking Boston official said it appears crack cocaine was being smoked in Julio Ceus’ apartment and drugs appeared to be a motive for the slayings, the first homicides in Boston this year. Two men were seen fleeing the apartment building. No arrests have been made nor any suspects identified, Boston police said. Police said the victims were targeted and it was not a random act of violence. Allston shooting victims were targeted, police say - The Boston Globe: "Relatives told reporters this morning someone called the 33-year-old man on his cell phone asking him to open the door to his apartment. They said when he opened the door, at least one gunman fired into the apartment. A police statement said preliminary investigations reveal the victims were targeted and that it is not a random act of violence." This time it is a dog electrocuted walking on a Charlestown sidewalk. Last March a dog was killed in Allston. Seems the problem is still too real. MASSACHUSETTS' DISTINGUISHED promise of worker safety is fraying. More of our workers work unsafely. When they sustain a serious work injury they are less able to access the protections of our four-generations-old workers' compensation system ... activist groups such as the Allston-based Brazilian Immigrant Center have monitored the immigrant workforce and its challenges. ''Public safety. We not only need to put more police on the streets, but we also need to increase the number of detectives, so that we can get some of these unsolved crimes solved.'" Future of American Legion Post on Chestnut Hill Ave.
Just after World War II, the City of Boston sold the Mary L. Brock School, a historic building on Chestnut Hill Avenue, to the American Legion Post in Brighton for $500. Last year, the Post sold the building for $1 million and the veterans of the post kept the money, approximately $20,000 each. The new building owner plans to convert it to a center for Muslims that will host daily prayer sessions, lectures, and other activities. Criticism has emerged on two fronts, from those who say the veterans should not keep the money and from residents who have raised concerns about the center. Bill Haas, cochairman of the Chestnut Hill Task Force, said residents are worried about density along Chestnut Hill Avenue. A resident's petition asking the BRA to conduct a traffic study reflects concern about all of the development, not just the proposed center, Haas said. ''Whatever religion is there, if there is a lot of activity there, that brings density into the area," he said. ''It's not right to say as a community that Jews can do it and Catholics can do it and Muslims can't." Allston-Brighton TAB, Dec 30 - Oh what a tangled Web - "A white cloth banner with roughly drawn letters announce a new destination for Allston residents to keep abreast of what's going on in their neighborhood - www.PikeFence.com - a Web site that outlines the saga of the Lincoln Street fence, parts of which fell down after a mere six weeks, and the continued distrust among residents about Massachusetts Turnpike Authority projects. "